Gibson has been more or less synonymous with the electric guitar and along with Fender one of the two major historic manufacturers of the instrument. The introduction of digital technology in what was generally considered acoustic or electric territory was gradual and troublesome. There are lots of people that scoff when faced with computers, modelling based effects units or preamps, software or (even just digital in some cases) effects. It took many years for processing power to reach levels allowing decent emulation of vintage hardware, for software to become sophisticated enough to be accepted by the average rock player or producer, for people to slowly accept digital effects into their audio chain. And now, here comes Gibson with the HD.6X-PRO, a guitar that looks like a Gibson Les Paul, but one that sports a new humbucker pickup (Gibson Hex) that outputs a digital high-definition signal of each individual string to a specially designed unit that Gibson calls the Breakout Box (BoB) over Cat-5 cable and a RJ-45 plug. Where’s the innovation? Well, that’s supposed to lie with the pickup and the MaGIC bus, also developed by Gibson, seemingly in association with Cirrus Logic, a chip that can carry up to 32 channels over Cat-5 twisted-pair cable (as used in Ethernet). The company claims exceptional clarity and high definition, digital audio for each individual string allowing per-string effects processing; a first in non-MIDI guitar. This allows amazing tonal variety and radically different soundscapes to those we’re accustomed to by electric guitars. Still, I am very sceptical about the actual performance of the guitar, although Gibson goes to some length making it clear that this is as good a guitar as any ‘classic’ Les Paul; a better finish would probably help here. 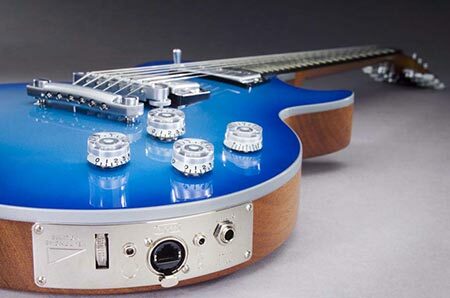 The ‘electric’ blue is too techy for a Les Paul if you ask me. I like the idea of per-string processing and from what I’ve seen and heard from the demonstration video it really does open up several possibilities for guitarists. Unfortunately, Gibson does not provide too many details about the system; in the few minutes I spent browsing the HD.6X Pro’s website I couldn’t find anything about the technical details (e.g. sampling rate, quantisation) of the signal. I have no clue about the specifics of the Hex pickup and, despite Gibson’s claim about the openness of MaGIC, I don’t think many applications currently support it, besides the included Cakewalk SONAR. All in all, this is a great idea, backed by one of the most recognisable and respected electric guitar manufacturers in the world so it has a considerable chance to really change the way guitars are built and used. Its current incarnation seems a bit strange, given the image the Les Paul guitar conveys and is associated with. I suppose only time will tell whether this is just another failed attempt at technological modernisation of the electric guitar or the beginning of a new era. According to MacNN the guitar costs about US$4,000 in the United States. I guess European prices will probably be somewhat higher, as usual. Image © Gibson Guitar Corp.